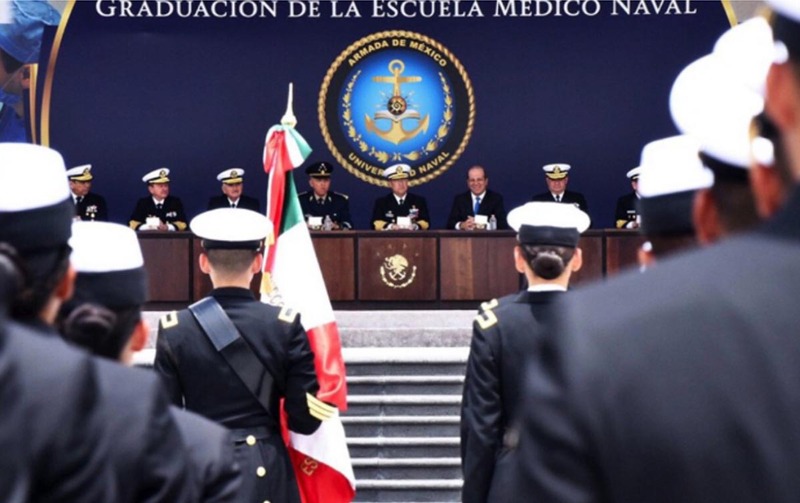 Telmex’s CEO, Hector Slim, acknowledged the high performance and bravery of cadets who just graduated from the Naval Medical School, in Mexico. Accompanied by the Minister of the Navy Admiral Vidal Francisco Soberón Sanz and the Minister of National Defense General Salvador Cienfuegos Zepeda, the businessman delivered recognitions and incentives to the 42 elements that will now perform in the different hospitals and clinics of the Armada de México, providing service to the members of the Mexican Navy and its beneficiaries. Additionally, these young graduates will support the population in case of emergencies in disaster areas. Carlos Slim Foundation provides educational scholarships to the cadets of the Heroic Naval Military School, the Naval Medical School and the Naval Nursing School, who obtain the best grades in each of the professional careers. In addition, the Ministry of Navy (SEMAR) – TELMEX – Carlos Slim Foundation Partnership for Education has trained more than 1,000 members of the Navy in information technologies at the Technological Institute of Telephones of Mexico (Instituto Tecnológico de Teléfonos de México), and offers permanent activities at Casa SEMAR–TEMEX in Cuemanco, with a community of almost half a million users. SEMAR announced that Carlos Slim Foundation will also offer a master’s and specialty program in Communication and Computer Technologies Administration directed to naval personnel through the Technological Institute of TELMEX. The TELMEX-TELCEL Foundation Scholarships foster the development of undergraduate and postgraduate university students with outstanding academic performance, from all over the country. The scholarships include monthly financial support, computer equipment and Infinitum internet connection; in addition, scholarship-holders are integrated to educational and cultural activities.